by Ubben, Gerald C.; Hughes, Larry W.; Norris, Cynthia J. With its focus on the critical elements of leadership essential for today’s school principals, this widely popular resource combines a strong research base with a practical, hands-on approach to help aspiring, new, and experienced educators become effective school administrators. Organized into four sections, The Principal presents a vision for leadership and learning and shows how to create a positive school culture, manage the organization, and interact with the external environment. The new edition reflects the evolution in the roles of educational leaders; explores the increased tasks that are requiring principals to expand their toolboxes of skills in such areas as instructional leadership, data analysis, technology utilization, staff evaluation, and community relations; and looks at the mounting demands to rewrite their job descriptions every year. The Updated 8th edition includes references to the new 2015 Professional Standards for Educational Leaders. Dr. Gerald C. Ubben, Professor Emeritus at the University of Tennessee is author or co-author of many books. Three of these books have been published by Allyn and Bacon/Pearson: The Principal, The Elementary Principals Handbook, and The Secondary Principal's Handbook(1980). One or more of these books has served the educational administration market each year since 1977. In addition, Dr. Ubben has written frequently in the periodical literature in his field of the principalship, curriculum, and school scheduling. After serving as a social studies/English teacher and school administrator, Dr. Ubben completed a doctorate at the University of Minnesota and taught for many years at both the University of Nebraska and the University of Tennessee in the field of educational administration specializing in the principalship. He currently serves as an elected official on his local school board, a local educational cooperative serving three counties, and a local county education foundation. Dr. Larry W. Hughes is the author, co-author or editor of numerous books as well. 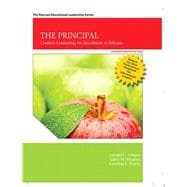 Four of these books have been published by Allyn and Bacon/Pearson: The Principal, The Elementary Principals Handbook,The Secondary Principal's Handbook (1980) and Public Relations for School Leaders (2000). He has written extensively in the periodical literature as well, both professional articles as well as popular travel pieces. Now retired, he had an extensive career as an organizational development consultant to private sector and governmental organizations. His focuses were team building, problem solving, time management and project planning. He traveled internationally both as a professor and consultant and for recreational purposes s well. He has his Ph.D. from The Ohio State University and other degrees from the University of Toledo. Dr. Hughes is married and the father of three sons. He has five grandchildren. Dr. Cynthia J. Norris is author, coauthor or contributor to numerous books, include The Principal. Other notable books include: The Moral Dimensions of Leadership: A Focus on Human Decency (Memphis State University) and The Learning Community: A Model for Developing Educational Leaders (Teachers College Press). She has contributed to the periodical literature on topics such as leadership vision, cohorts as learning communities, and moral and ethical leadership. Dr. Norris retired from both the University of Houston and the University of Tennessee and currently is a Professor of Education at Lincoln Memorial University in Knoxville, Her work in higher education has been distinguished by her contributions to preparation programs as part of the initial Danforth Foundation for the Preparation of School Principals and her pioneer work in the development of the first academic doctoral program at Lincoln Memorial University. Prior to her work in higher education, Dr. Norris had an extensive career in public education where she served as a teacher and director of special education and gifted services. Dr. Norris received her doctorate from the University of Tennessee in the field of educational leadership with a collateral in industrial management. . She has two daughters, one granddaughter and three great-grandchildren.